For the science teams, aircraft down days and no-fly days are data processing days. 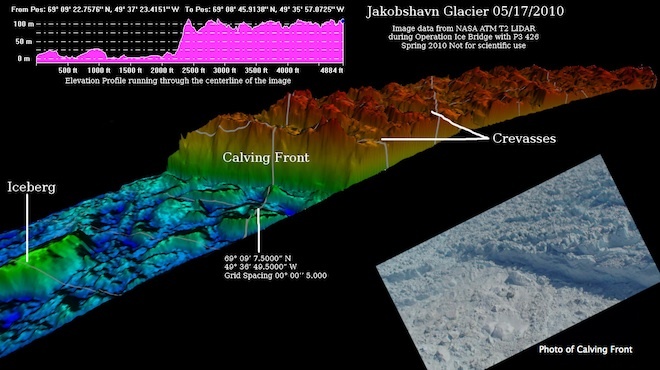 Below is an example of a laser scan, from the Airborne Topographic Mapper (ATM) instrument, of the calving front of Jakobshavn Isbræ (Sermeq Kujalleq). The 3D illustration of the data is at least as spectacular as the view out of the aircraft window. You are looking at a more than 300-foot-high cliff with huge icebergs and ice mélange — a dense pack of calved icebergs — in the fjord. Understanding the physics of calving and the role the ice mélange plays in this process are hot topics in glaciology. Transforming calving physics into realistic models of terminus behavior is crucial for reliable predictions of future sea-level rise. Calving fronts are not only quite spectacular features to watch but also important for understanding the mass balance of the Greenland Ice Sheet.